BBC NEWS | Programmes | Panorama | Should I fight back? Jeremy: He's now hitting her and the police haven't come, what do you do then? A Home Office minister has suggested people "distract" potential criminals while waiting for police to intervene. 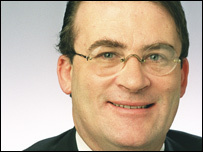 Asked by Jeremy Vine what people should do when confronted by anti-social behaviour, Tony McNulty MP agreed that jumping up and down could help. Mr McNulty says people waiting for help can "get back to the police, try some distractive activities." Panorama investigates whether people should fight back and what they can do if the police are not present. It questions the confusing advice about the best way to react after reading a leaked Home Office initiative with the slogan "Don't moan, take action it's your street too". The film which will be shown on Monday also finds out why former special forces soldiers have been hired by a housing association in Carlisle to combat anti-social behaviour. The soldiers use their training to get close to anti-social incidents which they film with covert cameras. The filming can potentially be used in police investigations as evidence. Tim Young of The Surveillance Group said of his team: "They're just as likely to get injured on the streets of a major UK conurbation as they were in Afghanistan or Iraq. "The difference is this time it's a 14 year old who may be carrying a knife. "In some of the country's major conurbations the lack of respect for the police, the lack of respect for the general public, seems to be reaching epidemic proportions, and it is very frightening." If you want to comment on this story you can call the Anita Anand Show on BBC Radio Five Live after 2200 on Monday 5 February on 0500 909 693. The security group is employed by councils all over the UK and sometimes even by the police who haven't got time to stake out estates like his ex soldiers. The film also highlights the story of Paul Catlow who confronted a youth about verbally abusing his mother. Mr Catlow claims the youth volunteered to apologise and went with him. But Mr Catlow ended up being charged with kidnap and spending a week in prison when the teenager claimed he had been forced into the van. The case collapsed at court. Should I Fight Back will be broadcast on Monday 5 February at 2030 on BBC One and live on this site where it will then be available to watch on demand.